and came eyes-to-eyes with a tiger. They stared at each other a very long time. This is why she knows so much. she says: tigers are marrying today. but I have told enough. ©2011 Janet S. Wong. All rights reserved. 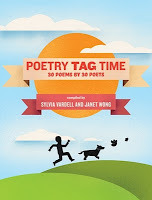 Not only is Janet Wong a remarkable poet, but she's also one of the driving forces (along with Sylvia Vardell) behind a great project - the Poetry Tag Time eBook. You MUST check this out. It's not only 30 poets and 30 poems, which by itself would be worth the 99 cent price, but the poets "tag" each other... handing off the poetry baton, if you will. So, the poems are linked - sometimes directly, sometimes loosely - which is a lot of fun on it's own. And you also get these great splashes of personality as they tag each other. It's a great idea, and the poetry is truly a blast. (And if you don't have a Kindle, the format the book is in, you can read it on most any device by downloading a Kindle app from Amazon. I read mine on my Mac). I hope you check it out. Yesterday brought us April is the Coolest Month by Douglas Florian. Tomorrow... A Stick Is an Excellent Thing by Marilyn Singer! For more information about 30 Poets/30 Days and ways to follow along, please click here. Okay, THAT was masterful! What a poem! Love it - I'll be thinking about tiger eyes and wisdom all day now. Thank you!, Janet! And thanks Greg for another amazing poetry project! What a beautiful poem. Thank you for sharing it with us. Ooh, love that last couplet especially. "This is why she knows so much" I gasped out loud. Thank you for inviting Janet to share. I am altered having read that poem. Now, we too, have stared into the tiger's eyes. Thank you for this, and all the rest. Love the month of April! A lovely companion piece to her first poem for 30/30. Both grandparents have a heck of a grandchild! Janet Wong is the tiger of free verse. Love this one. A.
Amy, I have to agree--Janet is definitely a tiger of free verse! She is also a little dynamo--and truly a driving force.